Subaru BRZ / Toyota GT 86 jointly honored with "Special Award"
The 2013 Subaru BRZ and Toyota GT 86 have jointly been honored with a very special award in Japan. 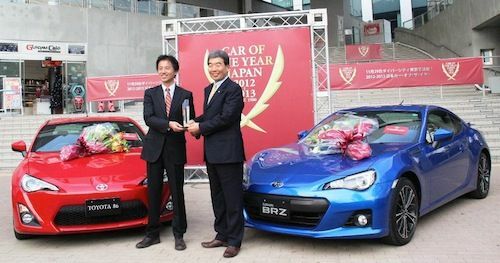 The 2013 Subaru BRZ and Toyota GT 86 have jointly been honored by receiving the 2012-2013 Car of the Year Special Award in Japan. This may be the first time in history that two competing automakers have been awarded a joint honor and the same award. The 2013 Subaru BRZ sports coupe was born out of a joint development venture with Toyota that resulted in the two automakers finding out that two heads are better than one. The two rear-drive sports cars have been wildly successful in the first 6 month’s of sales and interest continues to remain high among buyers. About the 2012-2013 Car of the Year Japan "Special Award"
Naoto Muto, Subaru Exec Vice President of Engineering with Toyota's Chief Engineer, Tetsuya Tada were on hand to receive the well-deserved award. The 2012-2013 Car of the Year Special Award is chosen by the Japanese COTY panel of jurors composed mainly of automotive experts and journalists. The two sports cars were selected from among all passenger cars newly released in Japan during the period from November 1, 2011 through October 31, 2012. The award is much different from the “Car of the Year” award and this "Special Award" is presented to recognize the car that has made an exceptional impact. The joint development project between the two Japanese automakers has certainly had a big impact on the automotive world around the globe. The 2013 Subaru BRZ has been wildly successful in the U.S., Japan, the UK and Australia. The Toyota GT 86 is offered in Europe and other world markets and demand has been high. The U.S. version is the 2013 Scion FR-S, and dealers in North American have experienced the same sales success. Toyota needed the Subaru boxer engine technology because of its horizontally opposed design that allows the engine to sit very low in the chassis. This creates a very low center of gravity and is the perfect design for a front-engine rear-wheel-drive sports car. Those who have driven the cars on a test track will testify to the cars exceptional handling ability in the corners at high speeds. Subaru benefitted from Toyota’s cutting-edge 4-DS direct and port injection that was added to the Subaru 2.0-liter naturally aspirated engine. The technology comes directly from the high-performance Lexus IS F.
Fuji Heavy Industries Ltd, who is the parent company for Subaru, worked with Toyota to come up with a car that Toyota CEO Akio Toyoda has dreamed about for a long time. Toyoda loves fast cars and is a certified test driver for Germany's famed Nurburgring. Before the creation of the BRZ / GT 86, Toyoda was quoted as saying, “where is the passion in our lineup?, I want to build a sports car.” It was a match made in heaven and the two Japanese giants are reaping the benefits around the globe. Subaru went into the project with its product concept "Pure Handling Delight - the driving experience taken to a new level.” Both cars were designed with a front- engine rear-drive configuration to provide a sporty driving experience with excellent handling characteristics. The FHI-TMC alliance is going to produce more good things and both automakers have plans for additional upgrades to the sports cars. Subaru is bringing out the new 2014 BRZ STI that will get additional performance upgrades over the standard model. And both manufacturers have plans for convertible models in the near future.